When is a pony not a pony? When it's a virtual pony. I've long wanted a pony to call my very own. Macworld Editorial Director and Gadgetbox Overlord Jason Snell knows this. I've repeatedly asked him for one to keep me company in the dark, dank dungeons of Gadgetbox HQ—or at least a plastic toy pony. Afraid that somehow I might plot my escape with the help of my new friend Flicka, he wisely refused. But remembering my love for the Nintendo DS, he decided to taunt me with news of Tantalus Interactive's new Pony Friends virtual pet game. 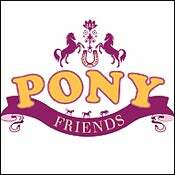 Accessible to all ages, Pony Friends will appeal to anyone with a love of animals. The game allows players to become immersed in a world where they can care for and groom a number of ponies and undertake surprise challenges from a cast of characters. Players create a stable filled with a choice of six authentic or customized pony breeds. Each pony can then be further personalized by choosing various attributes such as favourite foods, grooming tools, customized blankets, be-jewelled shoes and bridles and unique saddles. Clean your pony with shampoo and conditioner to give it a shiny coat.